Fall protection is essential when working at height, and one of the most effective ways to prevent falls is to keep workers safely away from leading edges. 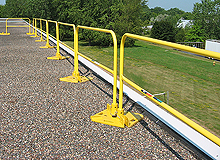 Use Garlock's innovative RailGuard 200 modular rail system to block access to fall hazards. Connect rail kits to create a barrier that is as long as you need. Kits are easy to assemble and disassemble without tools, making this system ideal for temporary applications and reconfiguration. Each rail kit includes 1 rail section, 1 base plate, and 2 locking pins that secure the rail in place. Bases are weighted and require no drilling, which helps maintain the roof's water integrity. Padded bases further protect roof surfaces. Powder coated safety yellow systems provide high visibility. Hot-dipped galvanized finish systems stand up to the elements for over 10 times the corrosion resistance of powder coat paint. GL-RG200-YLPD-7 Safety Yellow Padded 7'6"
GL-RG200-YLUP-7 Safety Yellow Unpadded 7'6"
Start by measuring the jobsite for the length of rail needed to guard the perimeter of your roof. Determine how many rail kits will be needed, using as many cost-effective 10' sections as possible. The weighted base plates each include four rail sockets and allow you to incorporate 90-degree and 45-degree turns into your layout. Configure your system as a closed loop for full perimeter protection. If you are not using a closed loop configuration, OSHA requires that you position an outrigger at each end. A 5' (minimum) rail kit placed perpendicular to the end of the rail run satisfies this requirement. To begin assembly, slot the first rail into one of the sockets of its base and secure with a locking pin. Position the far end of the rail in the next section's base and lock into place. Repeat to continue connecting rail sections. Fit the last rail section into the base where you started to complete a loop. If you are using outriggers, you must order an extra base plate to end the final rail section.